SOLD! Four offers... tough market... spectacular home... difficult buyer... and new agent on the other side! Seller's were incredible... one of the most difficult of escrows to get open... one of the easiest to close! The old adage of "Location... Location... Location..." will always be true. 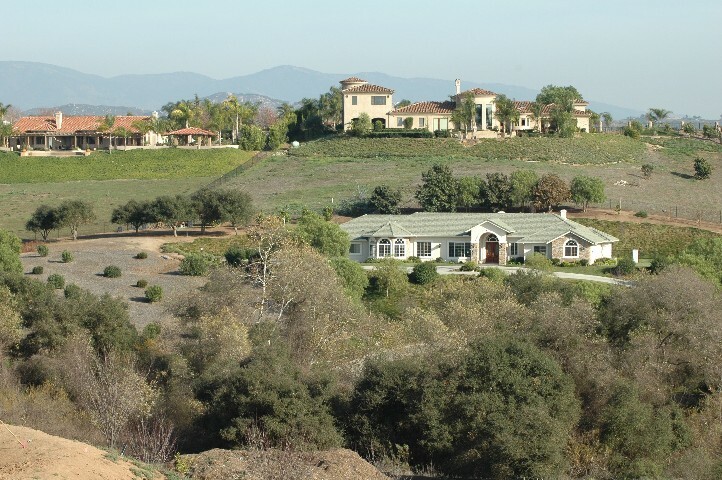 And 4158 La Canada Road in "Weather Paradise" Rancho Fallbrook is another example of why. Surrounded by homes of similar and greater value the Principle of Conformity insures equity and appreciation. 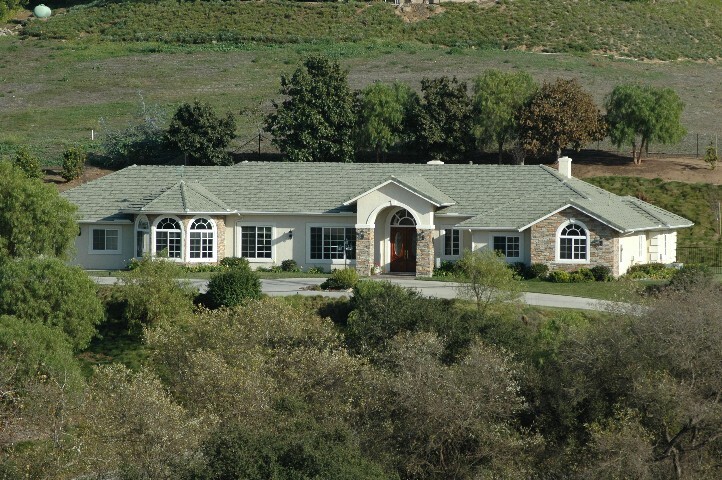 These wonderful estates ... sprinkled around the hillsides of historic "Rancho Monserate Spanish Land Grant" remind one of the South of France. The Low Density... Weather... and ease of access to San Diego Metropolitan area and the Beach Areas... provide one of the highest qualities of life available in Southern California. This particular residence... a "Don Walters" architectural masterpiece... is truly a treasure. In twenty plus years in the Industry in multiple Cities and States... Terri and I have never represented a home that was finer construction... better appointed... or better condition. Built in 2000... it is going on six years better than new. While surrounded by flat useable yard with a lush lawn.... the bulk of the two acres has been landscaped for low maintenance. Korean Grass "Zoysia tenuifolia" seen here.... above the driveway covers many of the banks and slopes. Other areas being mulched... and accented by Shrubs... the necessary yard work will be only chores of love. 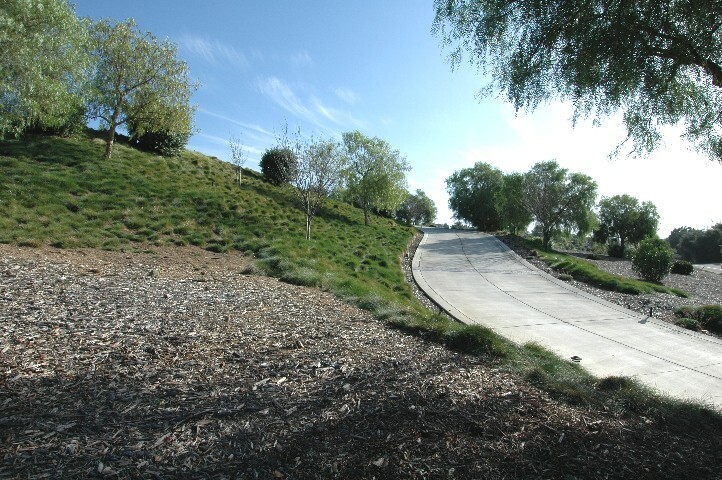 The drive shown above exits off of La Canada Road... across the street from a Sycamore "Platanus racemosa" and Live Oak "Quercus agrifolia" lined Riparian Green belt. This home will not lose any view or privacy with growth in the area. Halfway up the drive... 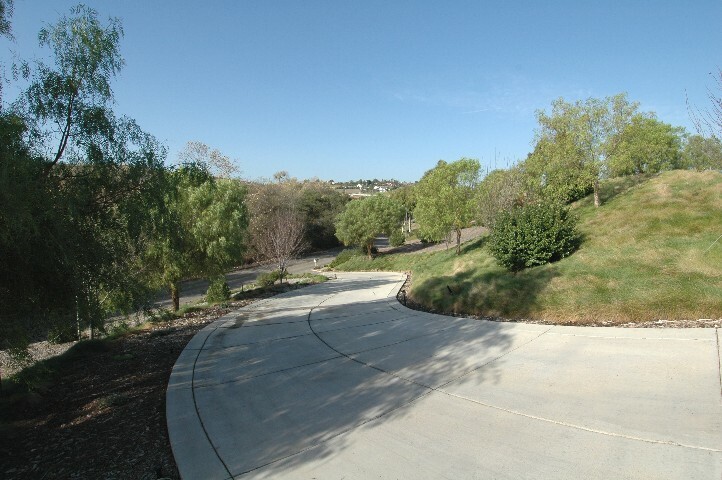 I stopped in the shade of a beautiful California Pepper Tree "Schinus molle" and shot the photo back down the drive to show the quiet street... not visible from the home. Then... I walked a few steps up the drive and took the shot of the front elevation. Notice this driveway is wide enough for a car to get around another car parked. Way off to the North there... behind the garage... is hidden parking for more cars. This home is ready for any size party! This home is going to make an incredible first impression... but the lasting impression will be formed by the total experience yet to be seen!